Stephen Chow’s The Mermaid, reviewed. Even Sony’s publicists didn’t know Stephen Chow’s new movie was opening in the U.S. But it’s demented, great, and a hit. 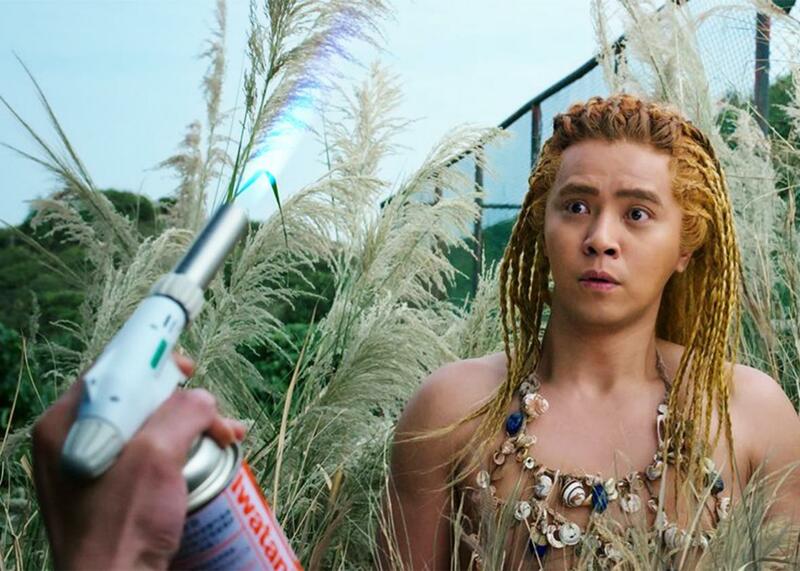 Show Luo plays the half-octopus uncle in The Mermaid. There’s an old film-critic proverb—maybe Manny Farber said it first?—Never waste your time writing breathlessly about the latest record-shattering numbers at the Chinese box office, because your sentence might be outdated by the time you put a period on it. Way back in late January—in this very magazine—I wrote about a film called Monster Hunt, which had just become the highest-grossing blockbuster in China’s history. And while a month ago it was hard to imagine that anything could ever top that fantasy adventure about a small-town mayor who gives birth to a vampiric radish creature, I simply didn’t know that Kung Fu Hustle director Stephen Chow had a 3-D mermaid message movie waiting in the wings. I won’t make that mistake again! As of Feb. 21, The Mermaid has pulled in more than $419 million in China, putting it nearly $40 million ahead of the previous record. Welcome to the contemporary Chinese film industry, where the rulebooks are written on an Etch a Sketch. But what’s truly amazing about The Mermaid is how it’s performing in the United States: This past weekend, a Sony subsidiary called Asia Releasing snuck the film into 35 domestic theaters without telling anyone, even their own employees. When critic Simon Abrams called Sony to discuss the release, three of the four reps he spoke to had no idea what he was talking about. On its first weekend, the film nevertheless grossed more than $1 million, raking in $29,000 per screen, almost twice the average of the blockbuster Deadpool. Well! There was barely an empty seat in the Times Square theater where I went to see The Mermaid on Monday night. The crowd was overwhelmingly Chinese and Chinese-American; the only other white person I saw was a fellow critic, hunched over his his notebook. And every single person in that theater howled at Chow’s shamelessly derivative, relentlessly idiosyncratic box office behemoth. Reimagining Hans Christian Andersen’s immortal story about the Little Mermaid and her beloved prince as a broad allegory for environmental negligence, Chow’s film doesn’t even let you into the story before you’ve survived a gauntlet of zaniness. The film opens with a country bumpkin leading a tour through his hilariously half-assed museum of aquatic discoveries. The grand finale of this tragic pageant: our pot-bellied guide lying shirtless in a bathtub with a wig on his head and a fish tail wrapped around his legs. (One of the visitors laughs so hard that he literally dies of a heart attack.) If this sounds great to you—it is great!—you’re well-primed for the spectacle to come. Deng Chao (whom Westerners might recognize from Tsui Hark’s Detective Dee and the Phantom Flame) is Liu Xuan, a real estate tycoon whose sparkly purple suit crinkles with the sound of new money. His latest financial scheme involves a sea reclamation project for which he’ll use explosive sonar technology to rid the area of its native inhabitants—the merpeople. With no other options, the underwater dwellers send the button-nosed Shanshan (Lin Yun, billed in the credits as “Jelly Lin”), to impersonate a human, crash one of Xuan’s lavish parties, and savagely murder him. What better way for a love story to start? The pair are an immediately priceless comic duo. Liu Xuan is part Cary Grant and part clown, so caught up in the act of performing his richness that he forgets he’s wearing a fake mustache. (Chow expertly chides his country’s nouveau riche without ever attacking them outright.) Shanshan, a bubbly human supercut of all the Disney princesses, shuffles along the fine line between charming and manic, fluidly able to slip between the roles of guileless heroine and desperate survivor. While several scenes find Chow matching the kinetic genius he displayed in Shaolin Soccer and Kung Fu Hustle (one early bit in which Shanshan repeatedly tries to kill Xuan is an instant slapstick classic, channeling Chaplin as Liu Xuan obliviously dodges her attempts to stab him in the feet or whack him over the head), the heat he conjures between his leads never rises above a low boil. That’s because Chow never bothers to pretend as if the romance really matters —it’s merely an excuse for a parade of blisteringly clever comic set pieces. In one of the finest, Show Luo, a strapping actor strong enough to survive Chow’s 2013 disaster Journey to the West, plays Shanshan’s half-octopus uncle. Forced to pose as a sushi chef, Show is cornered into a position where he has to grimace through the pain of severing and serving his own tentacles for lunch. There’s a reason that domestic distributors tend to import mediocre dramas over top-shelf mainstream comedies: Jokes are easily lost in translation. Not only is humor often inextricable from culture, but verbal punch lines arrive at different moments depending on whether you’re hearing them or reading them. It defuses a gag, or even a pun, to hear peals of laughter around you while you’re still scanning the setup, and most Americans aren’t used to being on the wrong end of that dynamic. But Chow, without overlooking his hometown crowd, directs with a primal wit that appeals to all audiences with the immediacy of silent cinema. In fact, it’s worth noting that the film feels directed at all—at a time when most champions of broad comedy are happy to cut together a hodgepodge of medium shots and get out of the way of their cast. (For example, Paul Feig, whose inability to compose a surprising shot is the only legitimate reason to be skittish about the Ghostbusters reboot.) In The Mermaid, Chow never forgets that the camera is the funniest tool at his disposal, and the only one that speaks in a language that everyone can understand.